To provide the best possible healing environment for kids and their families, Maria Fareri Children’s Hospital at Westchester Medical Center thought of everything—even the walls. The Pediatric Emergency Department at the hospital recently jazzed up its walls by adding murals to its refurbished reception area, main corridor, patient rooms and trauma rooms. 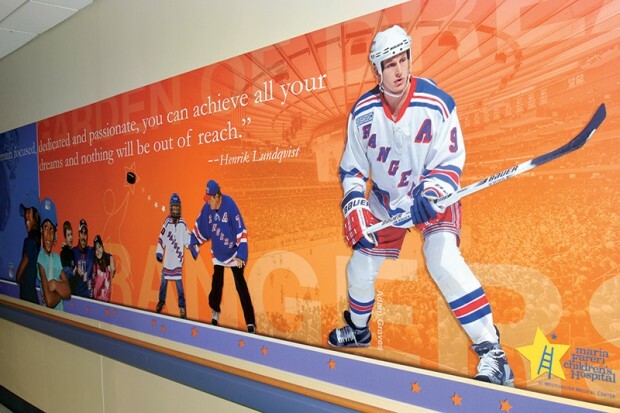 The murals—made possible by the Madison Square Garden Company through its Garden of Dreams Foundation—feature images of Radio City Music Hall and MSG stars, including players from the New York Rangers, Knicks and Liberty, along with inspirational quotes. One favorite comes courtesy of Fyodor Dostoyevsky: “The soul is healed by being with children.” For more about Maria Fareri Children’s Hospital at Westchester Medical Center, visit www.westchestermedicalcenter.com/mfch.